View of the Qudsia Bagh on the Jumna, Delhi (U.P.). Squared drawing for the aquatint published May 1795.
bl.uk > Online Gallery Home	> Online exhibitions	> Asia, Pacific and Africa Collections	> View of the Qudsia Bagh on the Jumna, Delhi (U.P.). Squared drawing for the aquatint published May 1795. Squared pencil drawing of the Quadsia Bagh on the Jumna, Delhi, dated 2 March 1789. Originally inscribed on mount in ink and pencil: 'North East View of the Cotsea Bhaug on the River Jumna, Delhi.' Pencil. 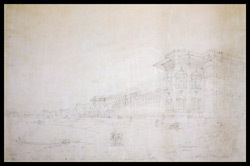 This is the original drawing for 'Oriental Scenery,' part 1, plate 3. The Qudsiya Bagh is a complex of summer palace, mosque and walled garden built by Udham Bai, the Qudsiya Begum, wife of the Emperor Muhammad Shah (1719-48) and mother of Ahmad Shah (1748-54). It was laid out in the 1750s along the west bank of the river Jumna, north of Shah Jahan's palace and fort in Delhi, which may be seen in the distance. The jalis or latticed screens in the corner towers are remarkable. Only the mosque now survives.